The Church of the Holy Name in Claygate was the stage for the finals of the Milbourne Lodge House Music Competition 2017. It was a wonderful evening of musical entertainment with a range of ages and abilities taking part. The House Finals is the culmination of a huge number of auditions and the best are selected to perform before an audience of pupils and parents. 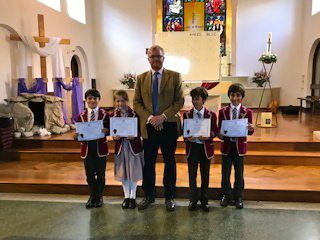 Our thanks to Mr N Smith, Director of Music at St John’s School Leatherhead who had the unenviable task judging the performances and awarding the final prizes. A special mention must go to Maxim Samartsev who performed ‘Quiet’ from Mathilda the Musical ( words and arrangement by Tim Minchin). It was a inspiring performance and a wonderful finale to a truly amazing competition.